Violence erupted in the streets of Paris on Tuesday as protesters demonstrating against the French government’s “ideological policies” and reforms clashed with a riot police squad, RT reported. Dramatic footage captured by RT’s video agency Ruptly showed people in the crowd turn and attempt to scramble back through the throngs of protesters as police in riot gear, armed with batons and tear gas, charged into the demonstration to clear a path through the street. After the charge, several officers of the French anti-riot CRS squad stood guard with shields as others detained a protester. The situation only heated up as protesters lit flares, while police launched another charge. Running through the plumes of smoke, police pushed the crowd back and dragged away another young protester. The young man appeared to be dazed by what could be a blow to his forehead, with blood pouring down his face and on to his jacket. People attempting to take photos or offer the man some help were blocked by police. More scuffles ensued, with demonstrators keeping police back with projectiles, fireworks and flares before being eventually dispersed. Organized by trade unions the General Confederation of Labour (CGT) and Workers' Force (FO), as well as student groups and retirees, the marchers were voicing their discontent at government reform policies, which they say damages France’s social model, promotes inequality and damages bargaining rights. 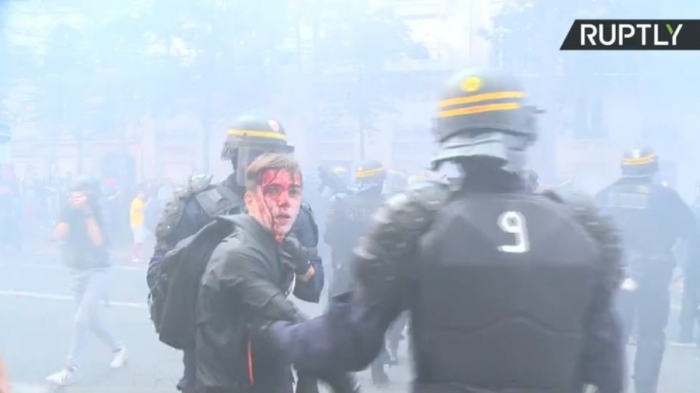 Clashes between riot police and protesters during this year’s May Day rally in Paris gained worldwide notoriety after footage emerged of a presidential aide to Emmanuel Macron was videoed partaking in the beating of a protester. Alexandre Benalla, who was off-duty at the time, was first given a slap on the wrist by the Elysee Palace, but was later fired amid public outcry after the scandal was made public.